On Thursday evening, the Fairfield University book store hosted Kate DiCamillo for a book talk and signing. 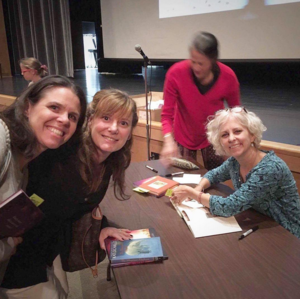 If you love Kate DiCamillo's books, hearing her speak makes you love them even more. While she was there to promote her new book "La La La," she happily shared the story of how she became a writer, answered questions about what inspired her characters and stories, and shared a bit of her writing process. While I wish I could have memorized every single thing she said to share with you, this column would go on for pages, and unfortunately, I don't have a photographic memory. My favorite thing she said was simply "writing is hard." Wow! I mean, I know writing is hard for me, and I'm sure if I posted the question here, several of you would agree. But for some reason, I had the misconception that writing is easy for writers. It isn't. It's hard, but they push through the difficulty and work hard, and we get beautiful books. DiCamillo said she gets up at 5:30 every morning and immediately sits down at her computer and writes two pages. She does this because she too has that voice in her head that says "you can't do this," but she finds the voice usually doesn't start until 9 a.m. Writing early in the day gives her the chance to write before she can mentally talk herself out of it. After she finishes her first draft, she lets it sit for a few weeks and then goes back and rewrites it, not once or twice, but more like eight times. Eight times. DiCamillo is an amazing speaker who is most touched by the connections stories bring. She loves the connections her fans feel to the characters, the connections that happen between her characters on the pages, and the connections books create among people. Do you remember the movie "Castaway" where the main character, played by Tom Hanks, is on a deserted island and his only companion is a volleyball? When that movie came out, I remember wondering how one person could captivate an audience for most of a movie. Then I saw the movie and realized it was possible for one person to tell the story. DiCamillo's new book "La La La" consists on one word ... LA ...I wondered how you could tell a story with one word. I couldn't wait to get home with my new signed book and read it. DiCamillo's brilliance as a story teller combined with Jaime Kim's talent as an artist made this book such a wonderful story. Yes, the whole story is told using one word, but the interaction between the main character and the the other characters in the book tells a wonderful story of finding connection. Sometimes we don't need lots of words to connect. "La La La" makes it onto my list of my absolute favorite picture books. It is beautiful and such a touching story. And Kate DiCamillo ... she's even more awesome in person than I imagined she would be when reading her books. If you have the opportunity to hear her speak, go. Seriously. Drive two hours to her book talk if you can. It's worth it. Really. It's worth it. I've heard several authors speak, and while I am not trying to compare anyone, I will say this was the most inspiring author talk I have ever been to. I drove home with a desire to pick up a pencil and write and push myself through writing even if I find it challenging to hopefully make something beautiful. If you don't already follow Kate DiCamillo on Facebook, I highly recommend following her. She shares so much about writing there, and I'm always inspired by her after reading one of her posts.